The supply of residential units in Dubai continued to increase over the quarter, according to Jones Lang LaSalle’s (JLL) Q3 2017 Dubai Real Estate Market Overview report. JLL data has revealed there are currently more than 480 units in the residential segment, with up to 80,000 units which could be delivered before the end of 2019. A number of developers launched new mega residential projects at Cityscape Global in Dubai during September with large-scale developers such as Nakheel and Deyaar announcing projects worth AED3.2 billion and AED 1bn respectively. “This renewed sentiment does however raise the prospect of a potential oversupply on the back of sales achieved through more attractive payment terms,” said Craig Plumb, Head of Research, MENA, JLL. Accessibility will remain a key differentiator in the office sector. The experience of other global cities (eg: New York, London and Singapore) emphasises that accessibility to the transport network is a key factor in determining the attraction of different sub markets. The same applies to Dubai, with the preferred office locations benefiting from access to the metro network. Connectivity is a key factor in the emergence of new commercial districts and will dictate the timing with which Dubai South will mature from its present focus as a middle-income residential market to a new commercial district, as envisaged in the newly announced plans for District 2020. The road and metro links required to support this precinct are currently underway and the continued expansion of Al Maktoum airport, will further enhance the future attraction of District 2020 to office occupiers. 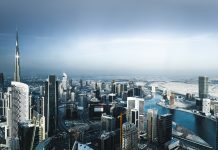 The third quarter saw the delivery of approximately 35,000sqm of office gross leasing area (GLA) across Dubai, with the largest completion being The Offices 3 tower in DTCD. “There is some risk with the materialisation of certain projects owing to volatile global markets and geopolitical conditions, which may result in corporates delaying or scaling back future growth plans. 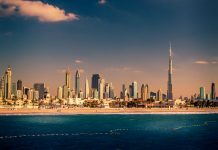 Another trend noticed recently is the increase in sublease space in Dubai, with tenants seeking to sublease surplus space resulting from previous more ambitious expansion plans,” JLL believes. Office rents have softened across Grade A quality buildings. Favourable renewal terms are being presented to retain tenants throughout the CBD, in the face of increased competition from the next generation of ‘best in class’ projects such as ICD Brookfield Place, which is attracting a lot of attention. 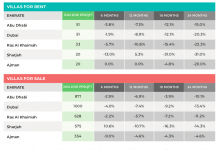 We believe these soft market conditions will continue into Q4, as landlords compete for fewer requirements, particularly when coupled with the considerable new supply that is coming on line in projects such as One Central. Office vacancies within the CBD have remained largely stable over the past quarter at around 8 per cent. The majority of completions during the third quarter were apartments (with a further 3,300 units delivered). Villas and townhouses contributed 660 and 75 units respectively. The largest completions were Duja Tower in Trade Centre First, adding 679 units and The Polo Residence in Meydan with 598 units. District 1 and Lila in Arabian Ranches 2 contributed 267 and 219 units respectively. According to Business News for Construction, construction activity across Dubai will increase still further over the next 2 years, with approximately AED350bn worth of contracts likely to be awarded prior to Expo 2020. Developers in Dubai have been particularly active in the residential sector with JLL data suggesting up to 80,000 units could be delivered before the end of 2019. Sale prices for both villas and apartments remained largely stable over the quarter, while rents continued their low single-digit declines. Anecdotal evidence suggests that numerous residential buildings (even within the prime areas such as Downtown and Marina) are seeing increased vacancies, and as such, tenants have been able to renegotiate their rents downwards by an average of 5 per cent-7 per cent. The total value of transactions of existing residential properties (excluding land) has also increased over 2017, with sales in the year to August exceeding AED3.7bn, up by 28 per cent from the AED10.7bn recorded in the YT August 2016. “This is supported by continued strong investor demand from countries like India and Pakistan,” said JLL. A total of AED2.7bn of sales of existing residential units was recorded in the month of August alone, with 20 per cent of this total occurring in Dubai Marina and a similar total in the Business Bay / Burj Khalifa area. Hotel performance remains under pressure, with the YT August RevPAR (AED 503) being the lowest level seen in the last decade. Occupancies on that other hand have hovered at a healthy 75 per cent since the beginning of the year. “The decrease in the Dubai hospitality market performance is perceived as an adjustment of the market rather than an indication of distress. The outlook for Dubai remains positive, especially as the city continues to invest heavily in tourism infrastructure and diversify towards new source markets such as South East Asia”, said JLL. Dubai has seen a 55 per cent growth in arrivals from China, following the relaxation of visa regulations at the end of 2016.